If you are running a business or in a profession, you know it is nearly impossible to function without NCR Carbonless Forms. However, you may feel that NCR Carbonless Forms are of no significance other than to help you perform a casual task. This can not be further from the truth. Every time you leave an NCR Carbonless Form with a customer/ client / patient, you also leave them with an impression of you, your business, and the quality of your goods / services. From the construction business to the medical profession, it is important to have people feel at ease, knowing you are professional, competent, dependable and trustworthy. The products you use are a reflection of this. Nu-Miracle Press NCR Carbonless Forms are of high-quality, having you feeling confident that you left a good impression, one of quality and professionalism, which is especially important if it is your first impression. For that, you may only get one chance. How can Nu-Miracle Press NCR Carbonless Forms give your business the edge and set you apart? Nu-Miracle Press offers NCR form printing services that meet the diverse needs of small and large businesses alike. Please contact us for a quote for your NCR Form printing needs. We make sure that every single detail of your company is presented with the utmost quality, displaying your branding strategy and logo on all your business marketing materials. 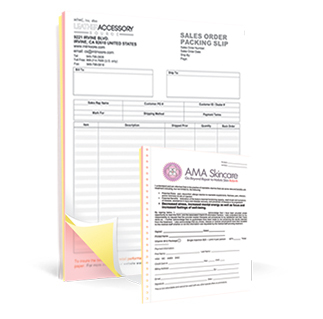 Full color NCR forms allow you to send invoices and other pricing forms with style. Additionally, we offer affordable NCR forms that your budget and wallet will appreciate. These features can be added to any form you request. Our custom made NCR form printing can meet any of your needs. Using carbonless NCR forms makes multi-copy forms simple with no mess. Whether you need a two part, three part, or four part form, Nu-Miracle Printing Services can help you accomplish your goals.